Important: You must have G Suite super admin rights to perform the actions described in this article. AODocs uses the G Suite Admin SDK Application Programming Interfaces (APIs) to access the lists of users and groups in your domain. This allows AODocs to control if a user account exists in your domain, to retrieve the list of users who are members of a Google Group, and many other security-related operations. 2. Log into your Google admin account. 5. Select Enable API access. AODocs uses the Drive SDK API to access and edit information about files stored in Google Drive. This must be enabled for all AODocs users, including storage accounts and regular users. 1. In your G Suite Admin console, press Apps. 3. Press Drive and Docs. 4. Scroll down and press Features and Applications. 5. Scroll down and then select the Allow users to access Google Drive with the Drive SDK API checkbox. This does not explain why you are performing the actions or who would need this. Hello Mirage, I updated our Knowledge base team. We will update the article in next synchronisation. 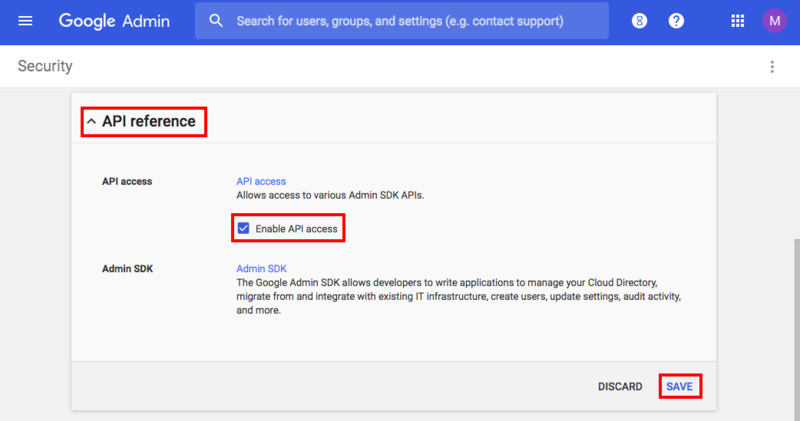 To answer you, the actions described here, require a G Suite super admin profile and they are needed for AODocs to be able to use the APIs (Google Drive, Directory APIs,..) to perform actions on the domains of our clients who installed and authorized AODocs.